Awareness of time is an ever-present factor of life. There are of course numerous parallel time codes by which we live. Indeed, the way each of us experiences time biologically and psychically rarely corresponds to the image of time with which we are most accustomed. Naturally, the image of time we are most familiar with is that represented by the clock. 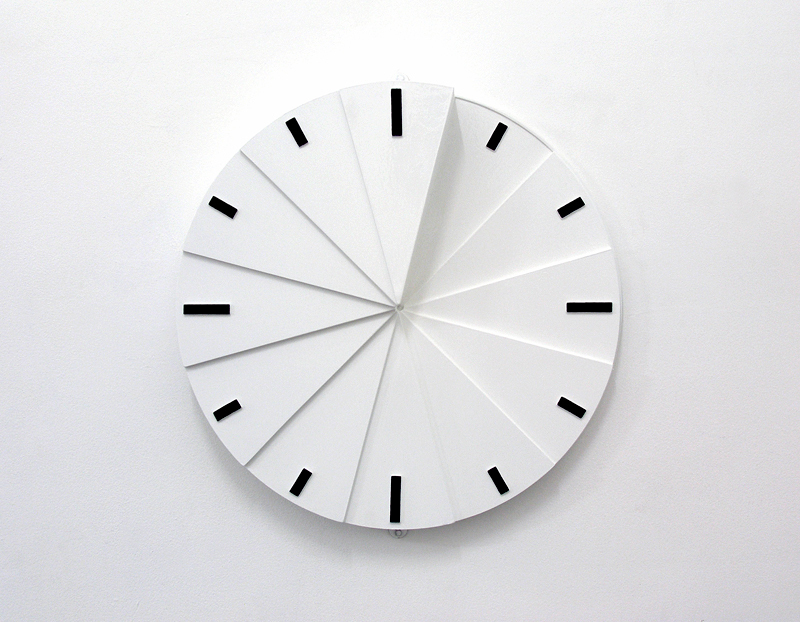 Clocks are mechanized tools that dictate and compartmentalise time viewed as necessarily materially productive. Clocks however, are also strongly associated with notions of the immateriality of thought. In fact, the insistent ticking of a clock (a cinematic cliché by now) has been repeatedly used to indicate intellectual purpose. In such instances, the thinker’s thoughts – invisible to us as they remain unspoken – are accompanied by the metrical audio pattern of the clock alerting us to an idea of thought itself: this is an audio-visual image of thought. Through this particular work, the common though often disregarded abstract nature of time, most fully embodied by the clock, is foregrounded. The convenient demarcation of hours we habitually take as inescapable, have become now part of an hierarchical accumulation, a physical accretion that literally penetrates space. Time is constantly built-up; it is an invisible architecture that pressures us as much as it enables us to realise projects. Nevertheless, despite its constant presence as a structural and motivational scaffold, time is also mute. Here, its limitations as an abstraction to be applied to everyone equally are embodied in a functionless clock devoid of hands: time’s ‘use value’ is always counteracted both by time’s cumulative inevitability and its ultimate inability to alter or prevent events.